You can find what ZIP codes are within the different DMA areas by utilizing the Query tool in MapViewer. In an empty project, click File | Import. 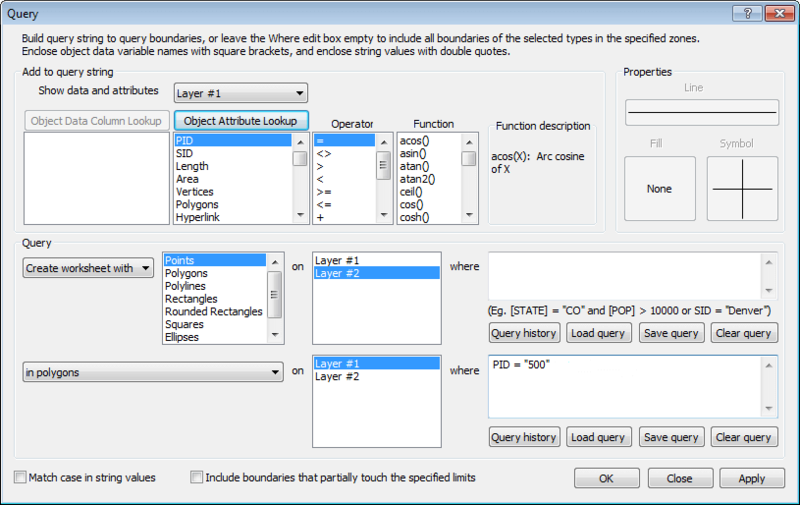 Select the DMA shapefile and click Open. In the Import Options dialog, in the Assign Coordinate System tab, leave the coordinate system set to Unreferenced local system. In the IDs And Attributes tab, set the PID and SID, then choose any other attributes you want to import and click OK. Right click in the Object Manager and click New Layer. Click Map | Create Map | Pin to make a pin map of the US ZIP locations on this new layer. Choose the ExtendedZIP5.csv file from the MapViewer 8 directory and click Open. In the MapViewer Warning dialog, click Yes to continue with the conversion between known and unknown projections. In the General tab of the Property Manager, verify that the Locating method is Coordinate, the X coordinate is Column B: Longitude, and the Y coordinate is Column C: Latitude. Click Analysis | Query | Query. In the Query section, use the first dropdown to select Create worksheet with. Select Points from the object list. Select Layer #2 from the layer list. Leave the query string ("where" box) empty. Set the first dropdown box on the second row to in polygons. Select Layer #1 from the layer list in the second row. Click in the query string in the second row. Up in the Add to query string section, use the dropdown next to Show data and attributes to select Layer #1. Double click PID in the attributes list. This will add this to the query string. Double click = in the operator list. Click the Object Attribute Lookup button. Select the DMA area you're interested in and click OK.
Use File | Save to save this worksheet in whatever format you want. Go back to the Plot1 tab and repeat step 8 for any other DMA regions you're interested in. The last query is remembered by default, so you should just need to change the value of the PID in the query string.